Find out information on how to make payments, submit a claim, process a preauthorisation request and determine your health plan’s subscription rates. Payments can be made monthly, quarterly or semi-annually. For more information on how to pay download our subscription payments & arrears notice. Preauthorisation is the process during which a service provider seeks confirmation and authorisation from the fund with regards to the availability of a member’s medical aid cover for a specific treatment, service or procedure. Upon receipt of all the required documents, the member/provider will be notified of the status of the member’s benefits and their associated coverage. It is financial reimbursement made to you or your service provider for medical services rendered. You may claim for reimbursement if you paid for your own treatment. Payment will be made in line with scheme rules and applicable tariffs. 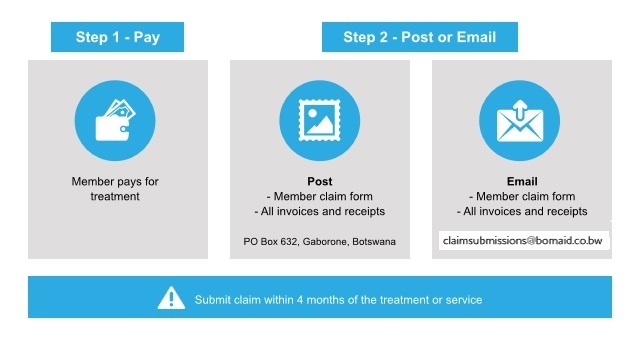 Submit your claims within 4 months of the treatment or service. You have a choice of where to obtain medical services (locally, regionally and internationally) in line with your health plan. If you are not sure whether a treatment or service is covered by your health plan, please contact our call centre on +267 3633100 for clarification. Reimbursement amounts will be in accordance with the exchange rate applicable and Scheme Rules and Tariffs. These claims are submitted by the service provider, but it is the member’s responsibility to ensure the details are correct. Payments will be deducted from your Bomaid account, and are subject to the same conditions as member claims. View our list of registered doctors and service providers who claim directly on your behalf. All medical scheme subscriptions are payable in advance, by the 7th of the month. For detailed rates information on your scheme, use our rates calculator, or call +267 (36) 33 100.